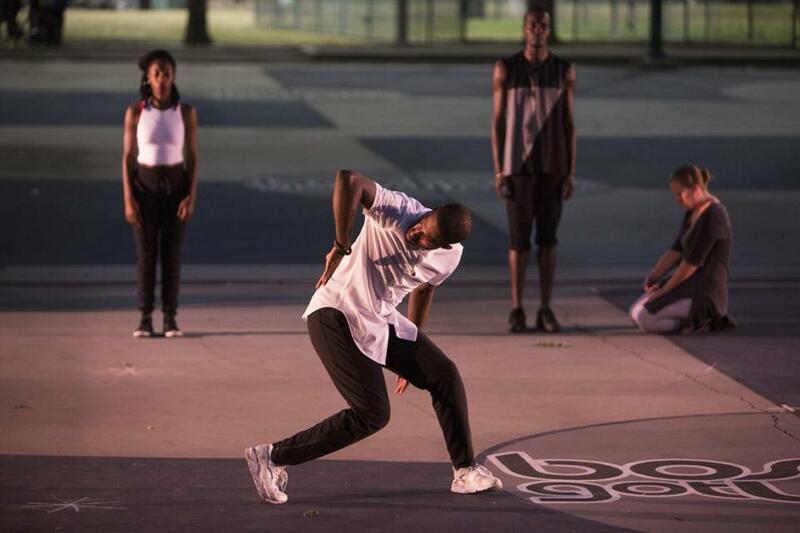 “Invisible: Imprints of Racism,” a performance of dance and poetry performed at Ramsay Park. On Thursday evening, as the sun set on the Ramsay Park basketball court, an eager crowd looked on. The stage, delineated only with a single line of pink sidewalk chalk, was filled with members of Anna Myer and Dancers/beheard.world, coiled around a poet reciting his work in rap-like rhythms. Earlier, two small girls who’d taken to doodling with the chalk had been gently cajoled to make way so a world premiere could commence. Something vital was happening. And as four policemen stood by, watching the show, the work brought a powerful message: We need to have a dialogue about race. Performed by nine dancers and three poets, “Invisible: Imprints of Racism” is an evening-length work choreographed by Myer in collaboration with the company. Not only is the subject matter of race in urban America timely, but if this performance is any indication of where dance may be heading, it’s an exciting time in dance. “Invisible” showcases how the blending together of different artistic mediums can create something entirely fresh, transformative, and vital. Performers with diverse dance backgrounds, from hip-hop to modern, were complemented by a mashup of spoken-word poetry, rap, and a recording of Andrew Bird’s haunting score. There were unpredictable environmental elements, too, from the cheery jingle of an ice cream truck to a siren from a fire truck, a car radio blaring pop music as it whirled down the block, the bark of a dog, and the cry of a toddler. At one point a plastic bag blew across the stage like tumbleweed, and a bicyclist rode right onto the court in his helmet to watch the dance. Such spontaneity enhanced the message that while any performance may be fleeting, many minorities live daily in a state of disadvantage difficult to escape. Myer blends hip-hop with modern, postmodern, and even some balletic elements, and she’s masterful at choreographing for a group: crafting clever transitions, placing dancers in formations like chess pieces on an intricate board. Gestures work well with the spoken word in “Invisible,” and never feel illustrative or overwrought. There’s the visceral clawing of the chest, and the covering of half the face, then the mouth. There’s a reaching out toward the audience, and the tremor of a hand. There are arms reminiscent of “Swan Lake,” but here on the basketball court they could be angel wings: a reminder of too many lives cut short. Perhaps the most striking image of the evening was a slender Ronnie Thomas tiptoeing with spine curved like an elegant insect, his elbows bent as if burdened with heavy luggage. And in a particularly jarring moment, Thomas partnered Darnell Brown over his shoulder in a pas de deux. Thomas laid him down, his body appearing lifeless as the impassioned poet Khadijah Lynch recited a heart-wrenching line about a mother’s broken heart. Audience members seemed to hold their collective breath. At times the performers’ direct address to the audience could feel uncomfortable, but perhaps that’s the point: to make us stir in our seats, and hopefully to provoke a dialogue. The steps leading down to the court were packed with onlookers, some of whom joined midway when they heard the commotion. And as the night came to an end, the performance seemed to dissolve into the backdrop. Audience members lingered as if trying to prolong the experience. Sophie Flack can be reached at sophie.bunheads@gmail.com.